Some of Easter Island's famous stone Moai statues stood more than 30 feet high and weighed up to 82 tons. Thetotal solar eclipse Sunday may only be visible to a lucky cadre of die-hardskywatchers spread across the southern Pacific Ocean, but that hasn't dampenedspirits at remote spots like Easter Island ? where tourists and scientists haveflocked to catch the celestial show. Thebest seats on Earth for the total solar eclipse are on Easter Islandand other islands and atolls along a southern Pacific Ocean path that stretchesfrom a spot just north of New Zealand to the tip of South America. Thousands oftourists are expected at Easter Island alone, drawn by both the looming cosmicshow and the island's mysterious history. 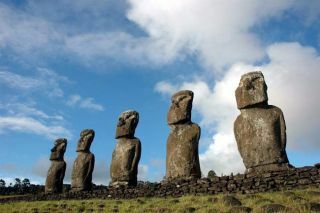 "Hereon Easter Island, I am very hopeful," Williams College astronomer JayPasachoff told SPACE.com from the remote location. Pasachoff and twostudents flew out to Easter Island to observe the total solar eclipse to studythe sun's corona. "Itwould be wonderful if the weather cooperates so that I can see my 51st solareclipse on Sunday," Pasachoff said in an e-mail. Pasachoffis hoping for clear weather because this will be the only total solar eclipseof 2010. The next one won't occur until 2012. Unlikelast year's total solar eclipse, which lasted more than 6 minutes and wastouted as the longest of the 21st century, this year's event will offer up to 4minutes and 41 seconds of totality when the moon blots out the sun. For viewerswatching the eclipse from EasterIsland,the event will begin at 18:41 UT (12:41 p.m. local time). Butthat path passes over just a few areas of land, including the Cook Islands,Easter Island, some French Polynesian atolls and the southern tip of SouthAmerica. Eclipse hunters have gathered at many of these locations, as well ason chartered cruise ships, just to see the eclipse. CharlesFulco, a space and environmental systems coordinator for schools in PortChester, N.Y., told SPACE.com that the excitement at the end of the eclipse'spath is mounting. Fulco is with a group hoping to watch the eclipse from thePatagonia region of Argentina, with the Andes mountains as a backdrop. Cloudyweather, he said, is the biggest fear. "We'reall keeping our fingers crossed," Fulco said in an e-mail. "Thescenery is completely amazing." EvenNASA scientists are expecting a stunning show. "It'sgoing to be a beautiful sight," said Lika Guhathakurta of NASA'sHeliophysics Division in Washington DC., in a Friday statement. Guhathakurtahas seen more than eight solar eclipses in different observation points,including busy cities, lonely deserts and remote mountain peaks. But sheexpects Sunday's event could the most dazzling she's seen yet. "TheSouth Pacific eclipse could top them all," Guhathakurta said. Guhathakurtasaid the chance to see the sun's corona makes the rare sight of a total solareclipse even better. "Youcan only see this while you are standing inside the shadow of the moon,"she said. "It is a rare and special experience." NASAscientists have been monitoring the sun's corona using the twin STEREOsatellites that watch the sun from positions ahead and behind the Earth. Afterstudying that data, Guhathakurta predicts the corona will appear as fourghostly-white streamers, two on either side of the sun, that stretch out two tothree degrees, forming a gossamer "X" in the sky with a black hole(the moon) at the center. "I'mprepared to be wrong," Guhathakurta said. "This is the first timeanyone has tried to make such a forecast using STEREO data. It will beinteresting to see if it works." Sixastronauts might get to see the eclipse from a remote, but very different,island. But their island is a largest structure ever built by humans in space:The International Space Station flying 220 miles (354 km) above Earth. Theeclipse should be visible to astronauts on the station as the sun appears torise over the Earth's limb ? or horizon, NASA officials said. "Thesun does rise while eclipsed by the moon," NASA spokesman Kelly Humphriestold SPACE.com from the Johnson Space Center in Houston. "A noticeablebite out of the sun might be visible as the sun rises through the Earth'satmosphere." Becauseof the location of the space station at the time of the eclipse, the astronautswill not be able to see the moon's shadow onEarthas they have during past solar eclipses, Humphries said. ButNASA's Mission Control team in Houston did send a special note to the spacestation crew telling the six astronauts living onboard when and where to lookon Sunday if they want to try and see the eclipse. Sundayis an off-duty day for the station astronauts and the eclipse will occur nearthe end of their day. But whether any crewmembers want to observe the event isstrictly their own choice, Humphries said. TheInternational Space Station is currently home to three American astronauts andthree Russian cosmonauts. Oneof the Americans, NASA astronaut Douglas Wheelock, has been posting photos fromspace on Twitter under the name Astro_Wheels, and may be the best chance forany solar eclipse photos. After all, Wheelock did snap a photo of the partial lunar eclipse on June 26. "Theview from Earth orbit of the Lunar Eclipse during Saturday?s beautiful fullmoon," Wheelock wrote at the time. "The eclipse in progress with theEarth?s shadow moving across the surface of the moon, simply breath-taking! TheMaster?s handiwork." Humphriessaid Wheelock and his station crewmates are not scheduled for any activitiesduring the upcoming total solar eclipse because it will occur just before theirscheduled sleep time.